1) Séville – D’azur à deux chaudières échiquetées de gueules et d’or la cornière de gueules l’une sur l’autre et trois serpents d’or issants de chaque côté de chaque chaudière. English: Azure two cauldrons checky gules and or the corner irons gules in pale and three snakes or issuant from each side of each cauldron. 2) Ducs de Medina-Sidoma – Andalousie – (Ducs, 1445) – Écartelé en sautoir aux 1 et 4 d’azur à une chaudière échiquetée d’or et de gueules la cornière componnée d’or et de gueules et cinq serpents de sinople langues de gueules issants de la chaudière aux 2 et 3 d’argent à cinq mouchetures d’hermine de sable 2 1 et 2. English: Quarterly per saltire 1st and 4th azure with a cauldron checky or and gules the corner irons compony or and gules and five snakes vert langued gules issuant from the cauldron 2nd and 3rd argent with five ermine tails sable 2 1 and 2. 3) Comtes de Teba – Castille – Voir von Gusner und Commorno – D’azur à la bande d’or ch de trois étoiles de gueules Cimier un buste d’homme posé de profil habillé aux armes de l’écu coiffé d’un bonnet pointu d’azur retroussé d’or.. English: See von Gusner and Commorno – Azure a bend or charged with three etoiles gules Crest: a bust of a man placed in profile dressed with the arms of the shield wearing on the head a hat pointed azure turned up or. This is an old Spanish-Visigoth last name of uncertain origin. One theory states it derives from the Visigoth words guz man, meaning “good man”, and hence developed as a nickname for a person who displayed such traits. A second theory holds that this surname derived from an old Germanic personal (first) name that was in used during medieval times. Third, some people this is a topographic surname referring to a person who lived in or was from the villages of Guzmanes in Burgos, Spain. Some spelling variants or names with similar etymologies include Gusman, Gusmao (Portuguese form), Guzaman, Guzmann, Guzzman and Guarman. The earliest documented bearer of this surname was Rodrigo Munoz de Guzman who was documented in 1134 AD. 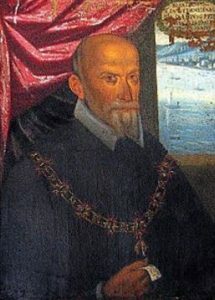 He is considered to be the progenitor/ancestor of the noble house of Guzman and was a Castillian magnate and a tenente (tenant-in-chief) in the village of Guzman, Burgous. According to Wikipedia, a tenant-in-chief, is a person “who held his lands under various forms of feudal land tenure directly from the king or territorial prince to whom he did homage”. 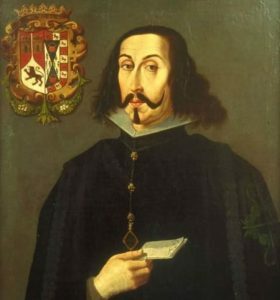 He married Mayor Diaz, daughter of Diego Sanchez (who died at the Battle of Ucles) and Enderquina Alvarez. 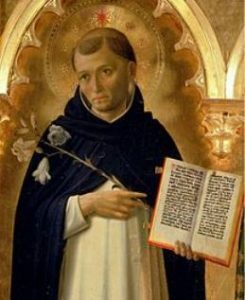 There was also a Catholic saint named Saint Dominic de Guzman (also called Dominic of Osma or Dominic of Caleruega), a Castilian priest who founded the Dominican Order, born in the Kingdom of Castile in 1170 AD. The only possible Guzman family motto I have identified is Praeferre Patriam Liber Parentem Decet, which when translated from Latin to English means: “A free homeland is of greater importance than the death of a kinsman“. According to this heraldry blog, “The arms of Melilla are those of the Duchy of Medina Sidonia. 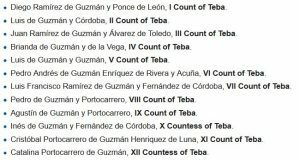 The motto recalls the heroic act of Duke Guzmán the Good (1255-1309) during the siege of Tarifa by Sultan Ibn Yacoub and the infamous Infant John (1294): when the besiegers announced they would kill Guzmán’s son, they had captured, if the town did not surrender, Guzmán did not surrender but threw down his dagger to them”. The last name Guzman ranks 230th in popularity in the United Status as of the 2000 Census. This represents very strong growth, as in 1880, it ranked 21,549th. The name ranks particularly high in the following six states: California, Nevada, Texas, New York, Illinois, and New Jersey. The surname Guzman is also found in many other nations. It’s frequency/commonness ranks as follows: Mexico (36th), Colombia (58th), Philippines (58th), Dominican Republic (18th), Nicaragua (105th), Cuba (102nd), Costa Rica (87th), Guatemala (42nd), Chile (48th), Venezuela (68th), Peru (80th), Bolivia (13th), Argentina (79th), Spain (173rd), El Salvador (48th), Ecuador (111th), Honduras (103rd), Panama (173rd), Paraguay (335th), Uruguay (548th), Dominica (96th), and Belize (142nd). Other settlers in colonial America and the New World bearing this Spanish last name include: Leonor Guzmán (Hispaniola 1560), Diego Guzmán (New Granada 1561), Juan Guzman (Peru 1551), Lucía Guzmán (Nicaragua 1566), Elvira Guzman (Guatemala 1566), Pedro De Guzman (United States 1809), and Francisco De Guzman (United States 1813). 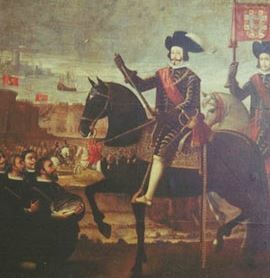 We have 3 coats of arms for the Guzman surname depicted here. These 3 blazons are from Jean Baptiste Rietstap’s book Armorial General, which was published in 1861. The bottom of this page contains the blazons, and in many instances contains some historical, geographical, and genealogical about where coat of arms was found and who bore it. There are hundreds of notable people with the Guzman surname. This page will mention a handful. Famous people with this last name include: 1) Alejandra Gabriela Guzmán Pinal (1968) who was a Mexican singer-songwriter, musician, and actress from Mexico City whose pop music had sold over 20 million albums, 2) Antonio José Ramón de La Trinidad y María Guzmán Blanco (1829-1899) who was a military leader, statesman, diplomat, and President of Venezuela from 1870-1877, 3) David Alberto Guzmán Pérez (1990) who was a professional soccer player from San Jose, Costa Rica who played from 2009-2017, including a season on the Portland Timbers in the MLS, 4) Domingo Guzman (1975) who was a professional baseball player in the MLB who played from the San Diego Padres from 1999-2000, born in San Cristobal, Dominican Republic, 5) Elizabeth R. Guzmán who is a Peruvian born American political who was elected to the Virginia House of Delegates in 2018, 6) Fernando Guzmán Solórzano (1812-1891) who was the President of Nicaragua from 1867 to 1871, 7) Alonso Pérez de Guzmán (1256-1309 AD), also known as Guzma el Bueno, meaning Guzman the Good, who was a noble and Spanish hero during medieval times, and the founded of the lineage from which the dukes of Medina Sidonia descend*, 8) Ryan Anthony Guzman (1987) who is an American actor from Abilene, Texas who is known for his roles in the Step Up film series and the movie The Boy Next Door, 9) Don Luis Enríquez de Guzmán who was the viceroy of New Spain from 1650-1653 and viceroy of Peru from 1655-1661, and was the Marquis of Villaflor and the 9th Count of Alba de Liste, and 10) Luisa María Francisca de Guzmán y Sandoval (1613-1666) who was queen consort of Portgual from 1640-1656, the wife of King João IV of Portugal, born in Sanlucar, Spain. *While defending the town of Tarifa in 1296 AD, legend has it that his son was offered in exchange for the surrender of the town, at which point he threw down his knife for the enemies to kill his son with. From the book The Heraldry of Spain and Portugal by Reverend John Woodward, F.S.A. : “The Moorish wars are commemorated by crescents, chains, Moor’s heads, and by cauldrons, or cooking pots, which are among the most characteristic of Spanish charges. These cauldrons were with the banner (Pendon y Caldera), the insignia of the Ricos hombres, who were equivalent in rank to our own bannerets. 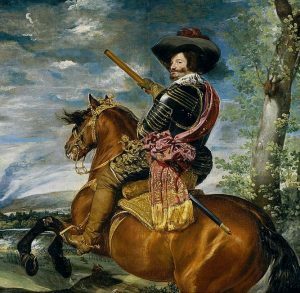 On their creation, the Spanish kings solemnly gave to each a banner and a cauldron, indicative of the power to levy troops, and to feed them when raised. Out of such cauldrons often issue (as in the arms of the Guzmans) a number of what no doubt were originally eels, but which are often blazoned serpents (perhaps, because there is a Guzman legend of a serpent being found in a cooking pot on some African expedition”.